Ditch Witch, a Charles Machine Works Co., was founded in 1949 with the first mechanized, compact, service-line trencher. A longtime innovator in the underground construction industry, the organization leveraged this expertise and knowledge when entering the mini skid steer market. The construction-grade machines and accompanying attachments provide landscapers, contractors and renters the power and functionality needed for a variety of small to midsize projects. 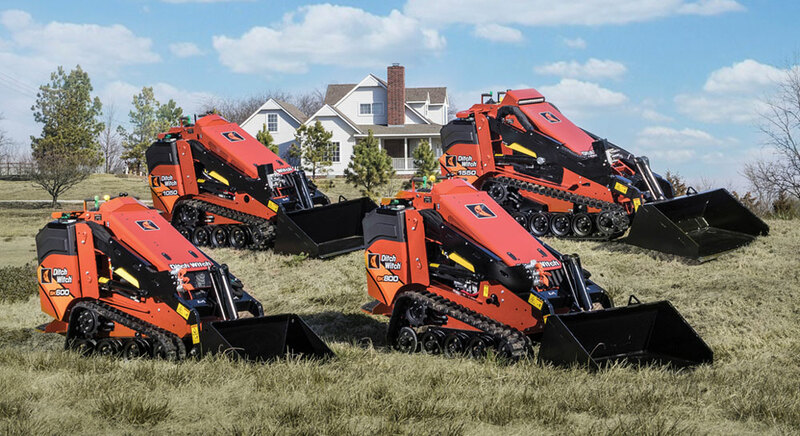 Designed for compact residential projects to large-scale irrigation and landscaping jobs, the Ditch Witch lineup of mini skid steers helps operators stay productive and comfortable on a wide range of jobsites. Each machine delivers maximum efficiency to the attachment, enhancing project speed and versatility. The construction-grade machines are designed for durability, longevity and ROI, says Ditch Witch. They offer a best-in-class operator platform and an easy-to-use, auxiliary-control foot pedal so operators can effectively maintain hydraulic flow to the attachment, notes the company. The durable design of the mini skid steers provides smooth rides while offering superior maneuverability on rough terrain, says Ditch Witch. The isolated operator platform enhances comfort for long hours on the job. These machines also eliminate a daily maintenance point, easing maintenance and reducing the total cost of ownership. As the most compact mini skid steer in the Ditch Witch lineup, the SK600 unit has a narrow frame for easy maneuvering in tight, residential spaces. Powered by a 24.8-hp Kubota diesel engine, this compact, mighty machine delivers enhanced productivity and versatility on jobs. Operators can rely on its ability to handle tasks that require heavy-duty strength and power with a 600-lb rated operating capacity and a 76-in. hinge pin height. The SK800 mini skid steer is equipped with a 24.8-hp Kubota diesel engine, providing power for all machine functions. With its 860-lb rated operator capacity and 83-in. hinge-pin height, the unit is engineered for productive loading. The construction-grade design is built with reinforced steel to withstand the rigors of jobsites. The SK1050 has a 37-hp Tier 4 Yanmar diesel engine that provides efficiency and directs 30 hp to the attachment. Combined with 15-gpm auxiliary flow and 3,625 psi, it leads to quicker jobsite cycle times, making crews more efficient and decreasing overall labor costs. The unit also has 1,062-lb rated operator capacity and 83-in. hinge pin height. The SK1550 is the largest and most powerful Ditch Witch mini skid steer to date. It is built to conquer a variety of complex landscape and irrigation projects typically suited for traditional skid steers, including tree handling and sod transfer. Powered by a 44-liter Tier 4 Yanmar diesel engine, the machine directs 34.5 hp to the attachment. It offers a leading 1,558-lb rated operating capacity to lift heavier loads — more than 50 percent higher capacity than other mini skid steers in its size class — according to Ditch Witch. For more info on Ditch Witch products, click this link.